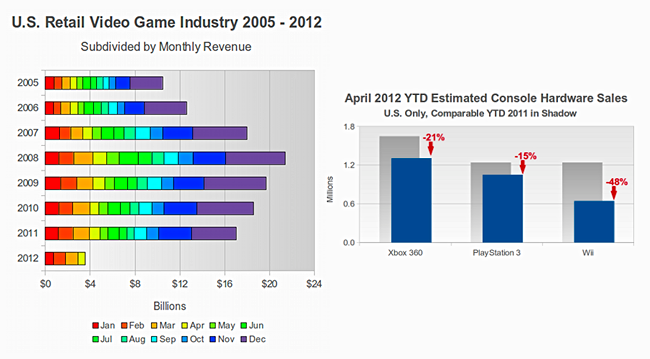 Gaming industry, you've been pwned. 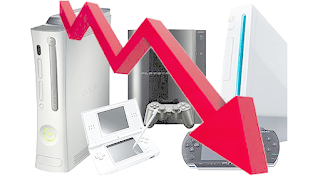 Last week, NPD Group reported (handheld and console) gaming software sales down 32% year-over-year, plunging from $503 million in April 2011 to the current $292 million. 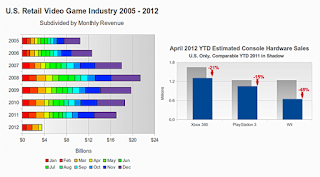 Assuming this trend continues, retail video gaming revenues in 2012 could be lower than the $12.6 billion earned in 2006...the first year for Sony's Playstation 3 and Nintendo's Wii, as well as the first full year of sales for Microsoft's Xbox 360. ...clearly, it's part of a trend. Even so, analyst Matt Matthews says many industry experts were stunned by this news. Not only was the decline in sales worse than most predictions (avg.~23%), but NPD's analysis also reveals no significant growth in any segment of the gaming market. Accessories sales were the sole exception, there, with a paltry 0.5% increase (to $148.6 million) that looks suspiciously like a junior accountant's rounding error. Yes, MobilePhonesFan found a few bright spots in the report; but overall it's hard times ahead for console makers and game vendors. Hit our source (below) for more excruciating details and a boatload of statistics.